Πατήστε τη φωτογραφία και δείτε όλες τις φωτογραφίες του Barn House. Set in Wentworth-Nord, Barn House provides self-catering accommodation with a terrace and free WiFi. This chalet also has a private pool. Composed of 8 bedrooms and 3 bathrooms, this chalet has a flat-screen TV with cable channels. 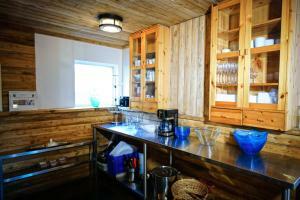 There is a dining area and a kitchen equipped with a dishwasher. The chalet offers an outdoor pool. A barbecue is available on site and both fishing and canoeing can be enjoyed within close proximity of the property. Mont-Tremblant is 40 km from Barn House, while Saint-Sauveur-des-Monts is 14 km from the property. Montreal-Pierre Elliott Trudeau International Airport is 67 km away. A damage deposit of CAD 1500 is required on arrival. This will be collected as a cash payment. You should be reimbursed on check-out. Your deposit will be refunded in full in cash, subject to an inspection of the property.